As far as I’m concerned, there is no bigger problem in Yankeeland right now than Luis Severino. Hard to believe considering how excellent he was earlier this season. Even with Aaron Judge and Gary Sanchez sidelined, and the SuperBullpen being anything but super lately, Severino’s crash back to Earth is the team’s biggest problem. He’s been terrible lately and this goes back more than a month now. Severino’s expected wOBA allowed in his first 18 starts was .285. Out of this world good. In his last seven starts, it’s a .386 xwOBA. Pretty bad. You didn’t need to see the numbers to know he’s getting hit harder though. Severino is allowing more hard contact and he’s allowing hitters to put the ball in the air. When that happens, bad things tend to follow. Severino is really struggling. We know that much. The worst part is that no one seems to know why he’s struggling. Or, if the Yankees do know what’s up, they’re not letting on. I suppose that isn’t surprising. The Yankees are very good at saying a lot of words without revealing anything. They like it that way. Against the Red Sox and White Sox, Severino struggled early before settling down and pitching well the rest of his start. That was encouraging. We didn’t see that against the Mets though. It was a grind right from the get-go. 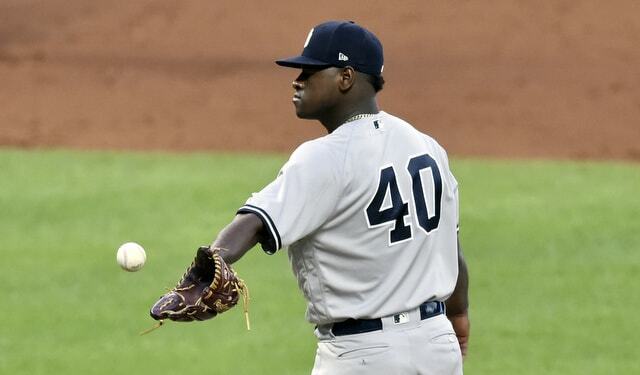 So, with Severino still laboring and ineffective, I figure this is as good a time as any to break him down a bit, and see what’s going on under the hood. Let’s get to it. Had Severino suddenly been missing 2-3 mph off his season average, then I’d be worried. Fluctuating a little in either direction each time out is pretty normal. Sometimes the ball jumps, sometimes it doesn’t. Severino is still the hardest throwing starter in baseball and the recent downturn in velocity is not particularly close to being a cause for panic to me. The arm speed is still here. Fastball is holding strong. That’s good. The slider? Not so much. It has been down his last seven starts, sometimes drastically. In his first 18 starts, the slider averaged 2,911 rpm. In his last seven starts, it’s down to 2,822 rpm. Still well-above-average and elite. But not as good as before. A decline in spin rate could be the result of something as simple as a grip issue. Maybe Severino has a small blister or a cut or a cracked fingernail, and it is preventing him from throwing his slider the way he did earlier this year. That would be the best and preferred explanation, as far as I’m concerned. Some cosmetic damage to his hand or finger isn’t a big deal. A decline in spin rate can also be indicative of injury. I’ve seen lots of pitchers pitch hurt over the years and Severino doesn’t look hurt to me. Injured pitchers don’t pump 97+ mph heaters and elite spin sliders with regularity. That isn’t to say Severino isn’t injured. It just means that if he is injured, he’s throwing better than any injured pitcher I’ve ever seen. This is kinda interesting. It is not uncommon for pitchers to have different release points for each individual pitch. No one throws a fastball the same way they throw a slider. The arm works in different ways. Last year Severino’s horizontal release point for his fastball and slider were tight together. This year they’ve drifted apart. This is the horizontal release point, remember. 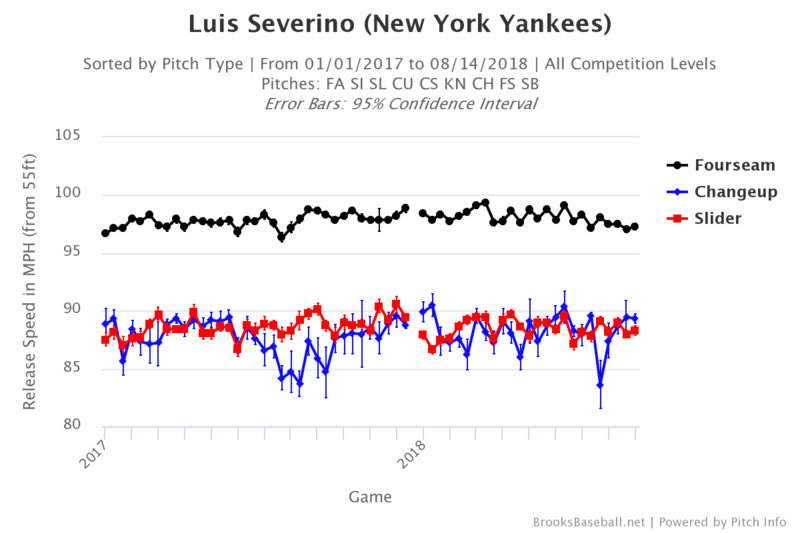 This graph is telling us Severino is releasing his slider closer to the third base side of the mound than his fastball. The difference is relatively small. Roughly two inches. And when a guy is releasing the ball 50-something feet from home plate and his arm is moving that fast, I’m not sure two inches is enough for the batter to pick up. Now here are Severino’s vertical release points. There’s always been a gap here — this means Severino releases his fastball from a higher spot than his slider, and again, the difference is about two inches — and lately that gap seems to be growing. Severino’s fastball release point keeps climbing whereas his slider release point has leveled off. The good news: Injured pitchers typically don’t raise their arm slot. When a guy is pitching hurt, the arm slot comes down because the same strength isn’t there. It could be that Severino is struggling and trying to compensate by throwing harder (i.e. overthrowing), hence the higher fastball release point. He certainly wouldn’t be the first young pitcher who tries to snap out of a slump by throwing the ball through a brick wall. Two things to note here. One, Severino has always had gap in vertical release point between his fastball and slider. The gap is bigger now than it has been at any point in the last two years, but the gap always existed. And two, Severino has had a gap in his horizontal release points all season. Even when he dominating earlier this year. This isn’t a new issue and he’s had success doing it. I’m not smart enough to know whether the release points issues are causing his slump. I’m just noting these release point gaps exist, and, in the case of Severino’s vertical release points, the gap has been growing the last few weeks. Is he tipping his pitches? This is always a possibility. It’s been seven starts though. The Yankees are not stupid. If Severino were tipping his pitches, it would not continue for seven starts. They’d have picked up on it and corrected it in short order. Severino has been hit hard by too many teams — he’s faced seven different teams during these last seven starts — for me to believe he’s tipping his pitches. That would mean basically half the American League has picked up on it, but the Yankees haven’t. Come on now. It seems like, every times a really good pitcher struggles, the default explanation is “he’s tipping his pitches.” I hate it. Sometimes it’s true! Most of the time it is not. Eduardo Perez even gave a vague explanation of how Severino might tip pitches during the ESPN broadcast the other night without actually saying whether he’s tipping pitches. A zero value added broadcast segment, that was. Maybe Severino really is tipping his pitches and the Yankees employ hoards of dunces who have not yet figured it out. I’d bet against it. The difference is 10.2 innings and 170 pitches, so two starts, basically. The season started earlier this year than last year — Opening Day was April 2nd last year, this year it was March 29th — which explains the added workload to some degree, but also keep in mind how much Severino pitched last year. He threw a career high 209.1 innings last season, postseason included. His previous career high was 161.2 innings in 2015. Furthermore, the Yankees went to Game Seven of the ALCS last year. Their season ended on October 21st. That means Severino had a shorter offseason to recover from that career high workload. Long story short, the kid’s thrown a lot of pitches the last two years, and the Yankees are aware of that, which is why they gave him that long break around the All-Star break. It’s great that Severino doesn’t feel tired, but I’m not sure how much I believe him. He’s a competitor and he wants to pitch. How many guys will admit to being fatigued? Pretty much no one, even if they are and know they are. The Yankees say they’re not planning to skip Severino’s next start — that would be Saturday against the Blue Jays — though two off-days next week allows them to give him nine days between starts after Saturday. Seems worthwhile. Two things stand out to me. One, the spin rate on Severino’s slider is dipping. Why? I don’t know. But he’s left a lot of sliders out over the plate recently, especially in two-strike counts, and opponents have hit him hard. The decline in spin rate could be the result of some problem that has been dogging him. Hopefully it’s just a grip. It happens. And two, Severino’s workload is really getting up there. Including postseason, he’s thrown 353 innings and 5,861 pitches over the last 17 months. That’s a lot for anyone, especially a pitcher who turned only 24 in February and isn’t the biggest guy in the world. The workload could be catching up to him, which doesn’t necessarily mean a second wind isn’t coming at some point. Using the off-days next week to give Severino another break seems like a no-brainer to me, especially since the Yankees are facing nothing but bad teams these days. 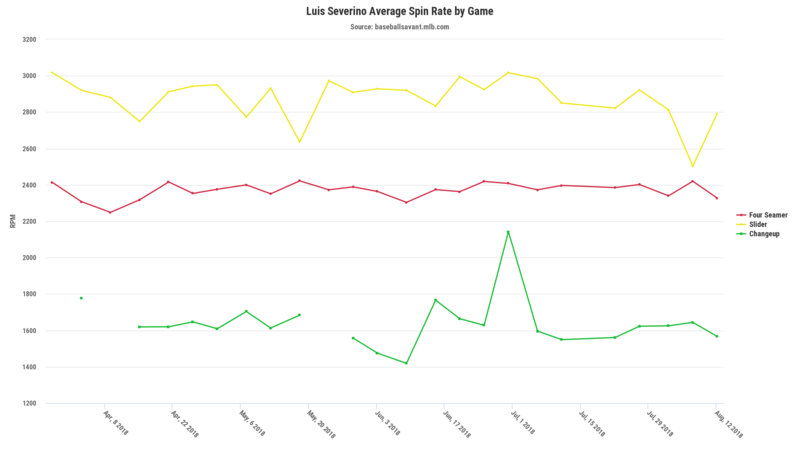 The fact Severino’s fastball velocity and spin rate are right where they always are is encouraging. That leads me to believe he’s healthy. Now it’s just a matter of figuring out what is wrong, and so far, no one seems to have any answers.